The original Tracking Resistance to Artemisinin Collaboration, or TRAC I, was a project aimed at determining the full extent of the spread and emergence of artemisinin drug resistance in Plasmodium falciparum malaria to inform malaria control and elimination strategies. The second iteration of the TRAC project, known as TRAC II, not only monitors for the further extension or emergence of drug resistance, but will also investigate the safety, tolerability and efficacy of Triple Artemisinin-based Combination Therapies (TACTs) – the first of its kind. In areas with failing ACTs, the aim of TACTs is restoring antimalarial efficacy, whereas in areas where ACTs still work or artemisinin resistance has not yet arrived, it has the potential to delay the emergence of drug resistance. The first TRAC study was a three year project across 15 sites in both Asia and Africa. The results of the study, published in the New England Journal of Medicine in July 2014, confirmed that artemisinin resistant falciparum malaria was firmly established in Western Cambodia, Thailand, Vietnam, Eastern Myanmar and Northern Cambodia. Since the publication of this study, artemisinin resistance has further extended into Central Myanmar, Southern Laos and Northeastern Cambodia. 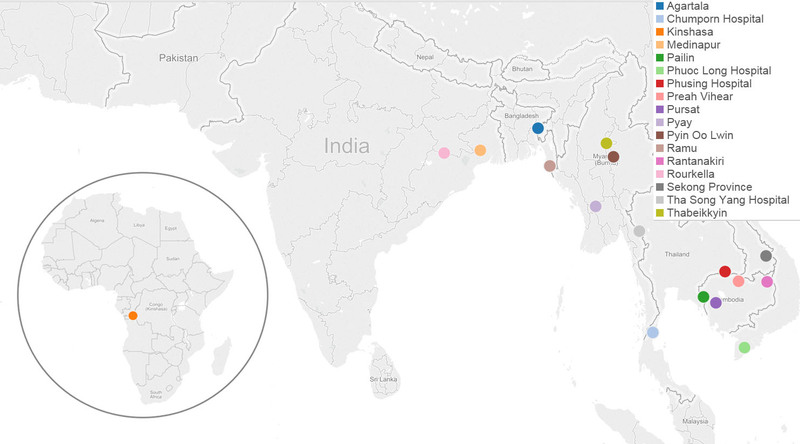 TRAC II explores if the resistant artemisinin phenotype has spread further westward into Myanmar, Bangladesh and India, and to what extent resistance to partner drugs has emerged in South and Southeast Asia. This is assessed by clinical studies looking in great detail at parasite clearance parameters and treatment efficacy, as well by genetic and transcriptomic methods and in-vitro sensitivity assays. The study covers 17 sites in eight different countries (16 in Asia, 1 in Sub-Saharan Africa). The first patient was recruited in August 2015. More than 1,100 subjects have been recruited in 8 countries (Bangladesh, Cambodia, Democratic Republic of Congo (DRC), India, Lao PDR, Myanmar, Thailand and Viet Nam). The preliminary analyses are being communicated at international conferences and have been shared with representatives of the national malaria control programs and the World Health Organization. Artemisinin drug resistance has selected for concomitant resistance to the partner drug in ACTs, in some areas resulting in high failure rates with artemisinin combination therapies (ACTs) – the current frontline treatment against falciparum malaria. Treatment failures after artemisinin combination therapies are likely to become more widespread in Southeast Asia. Currently ACT failure rates over 30% with the ACTs dihydroartemisinin-piperaquine and mefloquine-artesunate have been reported from western and northern Cambodia and the Myanmar-Thailand border areas. The failure of ACTs against malaria infection severely threatens malaria control and elimination efforts, and will accelerate the spread and emergence of resistance. The imminent danger of untreatable falciparum malaria in the region urgently requires alternative treatment options. This will have to use existing drugs, since new compounds are years away. In TRAC II, partner drugs with likely opposing resistance mechanisms are combined into Triple Artemisinin-based Combination Therapies (TACTs). The TACTs that are studied are dihydroartemisinin-piperaquine with mefloquine and artemether-lumefantrine with amodiaquine. The project examines the safety, tolerability and efficacy of these TACT combinations, and study the pharmacokinetic and dynamic drug interactions. In addition, TRAC II studies a recent developed synthetic trioxolane antimalarial arterolane, which is marketed in combination with piperaquine. The efficacy of this new combination is tested in areas of artemisinin and partner drug resistance. Novel vector control measures are urgently needed to aid artemisinin resistance containment efforts in Southeast Asia. This is due in part to the outdoor and early evening blood feeding behaviors of Southeast Asian mosquitoes that transmit malaria, which renders bednets and indoor residual spraying with insecticides less effective. Treating people with ivermectin can make their blood lethal to mosquitoes, and thus could be an effective control measure to target outdoor-feeding malaria vectors. Ivermectin mass drug administration (MDA) shows promise as a vector control tool in West Africa as it reduces wild malaria vector survival up to one week and suppresses transmission for two weeks. Ivermectin could be combined with antimalarial drugs currently used in MDA format in Southeast Asia. These multi-drug MDAs would clear asymptomatic malaria cases from the human population while simultaneously suppressing transmission by local mosquitoes preventing new malaria cases. A sequential clinical trial to assess the safety, tolerability, pharmacokinetic interaction, and mosquito-lethal efficacy of ivermectin, dihydroartemisinin-piperaquine, and primaquine was completed in 2016. The results of this study are expected to be published by the middle of 2019. TRAC II is the first study to trial the use of triple artemisinin combination therapies (TACTs) and will focus on the safety and efficacy of these treatments. Efficacy estimates will be based on microscopy and will be PCR-corrected. Microscopy-based parasite clearance estimates are obtained with the WWARN Parasite Clearance Estimator. Additional measurements will be performed to assess partner drug pharmacokinetics and pharmacodynamics, and to eliminate inadequate drug absorption as a cause of any eventual treatment failures. TRAC II is the first study to trial the use of ivermectin treatment as a vector control tool in Southeast Asia. Potential drug-drug interactions are currently being assessed. Efficacy data is based on mosquito lethality for Anopheles dirus and Anopheles minimus performed at AFRIMS. TRAC II, the extension of the TRAC project, was funded by a grant from the UK Government Department for International Development (DFID). The trial is led by Prof Arjen Dondorp (arjen [at] tropmedres [dot] ac)) and Prof Nicholas White and coordinated by Dr Rob van der Pluijm (rob [at] tropmedres [dot] ac). A large team of local investigators will be pivotal for the success of the studies. The trial will be overseen by a Steering Committee and a Data and Safety Monitoring Board. Clinical trial, laboratory, data management, statistical, logistical and administrative support will be provided from Mahidol-Oxford Research Unit in Bangkok. A large group of international collaborators will contribute to the different embedded scientific projects. WWARN researchers, under the guidance of Dr Mehul Dhorda, are responsible for quality assurance of specimen collection and processing, as well as microscopy. Imwong M et al. The spread of artemisinin-resistant Plasmodium falciparum in the Greater Mekong subregion: a molecular epidemiology observational study. Lancet Infect Dis. 2017 May;17(5):491-497. Epub 2017 Feb 2. doi: 10.1016/S1473-3099(17)30048-8. Miotto O, Amato R, et al. Genetic architecture of artemisinin-resistant Plasmodium falciparum. Nat Genet. 2015 Jan 19. doi: 10.1038/ng.3189. Das D, Cheah PY, et al. Participants' perceptions and understanding of a malaria clinical trial in Bangladesh. Malar J. 2014 Jun 4;13(1):217. Lim P, Dek D, et al. Ex vivo susceptibility of Plasmodium falciparum to antimalarial drugs in western, northern, and eastern Cambodia, 2011-2012: association with molecular markers. Antimicrob Agents Chemother. 2013; 57: 5277-83. Yeung S, Lawford HL, et al. Quality of antimalarials at the epicenter of antimalarial drug resistance: results from an overt and mystery client survey in Cambodia. Am J Trop Med Hyg.2015 Jun;92(6 Suppl):39-50. doi: 10.4269/ajtmh.14-0391. Epub 2015 Apr 20. PubMed PMID: 25897063; PubMed Central PMCID: PMC4455075. Charlwood JD, Tomás EV, et al. Evidence of an 'invitation' effect in feeding sylvatic Stegomyia albopicta from Cambodia. Parasit Vectors. 2014 Jul 11;7:324. doi: 10.1186/1756-3305-7-324. PubMed PMID: 25015104; PubMed Central PMCID: PMC4230241.